UK-based biometrics start-up, Voicekey has developed an iPhone app that could replace PINs as a means to validate financial transactions. The OpenSezMe app has been developed in conjunction with Nottingham Trent University. 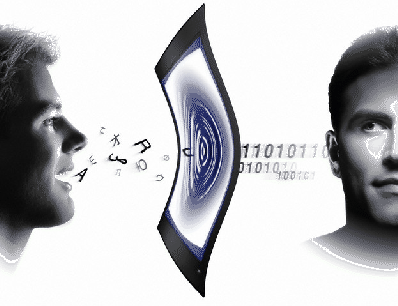 Using patent-pending software, it extracts unique features from an individual’s voice to forge personalized biometric ‘classifiers.’ These classifiers are then stored in either a central database or locally on a user’s iPhone. The app is available for free on the Apple App Store. 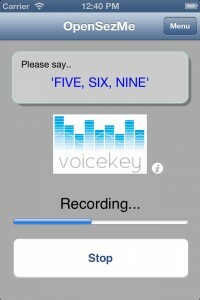 It prompts the user to speak a random phrase three times to establish the user’s unique voice biometric. 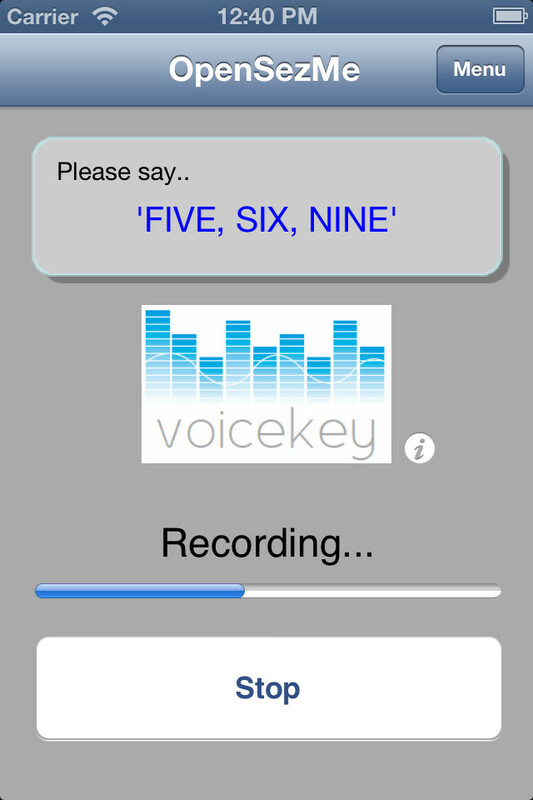 “The OpenSezMe app uses voice biometric technology to secure personal or confidential data on a mobile phone,” explains Tony Allen, Managing/Technical Director at Voicekey Ltd. While the app is currently being used more as a marketing aid for Voicekey and voice biometrics in general than a ready-to-use solution, the future use cases for the technology seem promising. When a user wants to access their data, they simply open the app and generate a verification sample by speaking a short, prompted random phrase that is then – along with the stored voicekey – sent to the Voicekey server. It is in the Voicekey server where the biometric verification process occurs, and transmits a confidence score back to the phone. Nottingham Trent University’s contribution to the project comes from Allen’s time as a student conducting academic research into the field of voice biometrics and speech-enabled systems. It is a move that has proven to be a beneficial one for the biometric start up, as Allen reveals that the future of Voicekey looks promising. “Since establishing ourselves as a company, we have been successful in securing three UK government grants/contracts to help develop this work and are currently developing an m-commerce solution based on this technology,” reveals Allen. Allen and his associates are certainly keen on advancing the technology and he reveals that later iterations of the OpenSezMe app will only provide greater functionality.